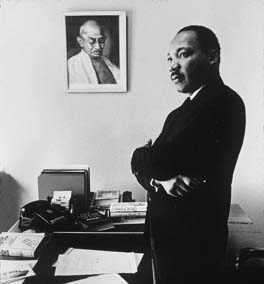 Deeply thanking Martin Luther King, Jr. Our office is closed today | Jon Katz, P.C. NOTE: This is a re-print from 2010’s Underdog entry on Martin Luther King, Jr., Day. Martin Luther King, Jr., presented his immortal "I Have a Dream" speech when I was just four months old. When he was shot dead on April 4, 1968, I was only five years and three days old, and he was only thirty-nine. He would have been eighty-two years old today. I have been very positively influenced by the nonviolent path in fighting for social justice from Gandhi and Martin Luther King, How did they take up and stay on the nonviolent path? For both, their deeply-held religious beliefs helped them on that path. For Gandhi — writes Radhika Rao –he was also influenced by the non-violence of his mother and of Tolstoy, and the civil disobedience message of Rousseau. Martin Luther King, Jr., was heavily influenced by Gandhi’s non-violent path, starting with Mordechai Johnson’s discussion of Gandhi. Ironically,hanging in King’s office was a picture of Gandhi; both were assassinated.